If you're wanting to get your hands on one of the best smartphones that money can buy, then the iPhone X from Apple and the Pixel 2 XL from Google have to be near the top of your shortlist – and here we're going to explain how they stand up against each other. We'll cover, design, specs and the other essential features of any modern mobile so you can decide which one suits you best (or just get an idea of which of these tech giants makes the best phone). We'll start by looking at the aesthetics of these two devices. Both the iPhone X and the Pixel 2 XL push the bezels right out to the edges of the screen, though only Apple's handset opts for a display notch on the front display. Around the back, Google goes for a two-tone and partially plastic approach (and a fingerprint sensor), while Apple goes all-in with glass. The Pixel 2 XL is the phone with a bigger display, 6 inches and a 1440 x 2560 pixel resolution up against 5.8 inches and a 1125 x 2436 pixel resolution. Both phones are big without being huge, though the iPhone X is slightly more pocket-friendly (the Google phone is marginally thicker as well). These are two of the best-looking phones in the business, and it's hard to split them in terms of their design aesthetics – it's really down to personal preference. For the iPhone X, your choices are silver or space grey, and for the Pixel 2 XL, you can pick from all black or a very stylish black-and-white model. The iPhone X comes with a top-end Apple A11 Bionic processor, 3GB of RAM, and your choice of 64GB or 256GB of internal storage. As is the norm for an iPhone, you can't expand that storage with a memory card, though you should have all the power you need to do just about anything you want with your smartphone. As for the Google Pixel 2 XL, it has a Snapdragon 845 processor, 4GB of RAM, and either 64GB or 128GB of internal storage – again, there's no option to expand that with a memory card. Those are also some top-end specs, and when it comes to raw performance, it's hard to split these two phones. While the iPhone X does have a dual-lens 12MP+12MP camera on the rear, the image processing on the single-lens 12.2MP camera on the back of the Pixel 2 XL means it takes photos that are just as good. You don't get any optical zoom on the Pixel 2 XL though, while the iPhone X can get you twice as close to the action. The iPhone X and Pixel 2 XL both offer IP67-rated water and dust resistance, which is almost but not quite as good as you can get. Only the iPhone X has wireless charging as an option though – it's something that we're still waiting for on the Pixel line of phones (maybe 2018 will be the year). 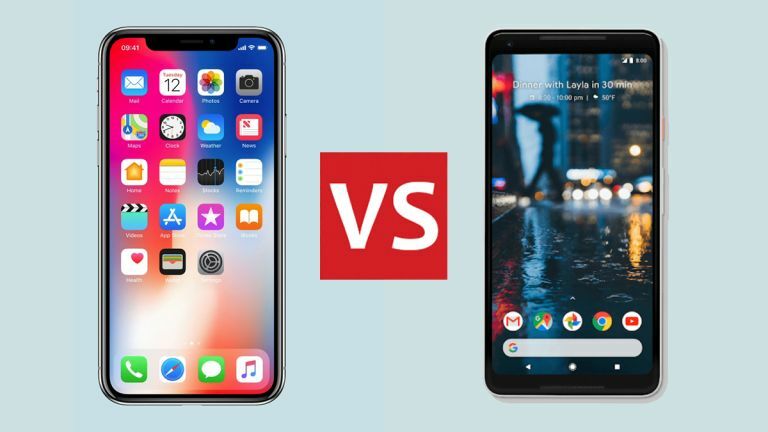 Of course there's also the small matter of Android vs iOS: which phone you prefer may well depend on which mobile operating system you get on with best, and how heavily invested you are in the Apple or Google ecosystems. Both Android and iOS are set to get major updates later in the year. Neither of these phones has a 3.5mm headphone jack, so you need to use wireless headphones or a Lightning (iPhone) or USB-C (Pixel) connector – in both cases you get dongles in the box though if you want to carry on using an existing pair of headphones. These are undoubtedly two of the best phones around at the moment. When putting them head-to-head, it's difficult to split them in terms of either the quality of the design and build, or the level of performance you can expect. Maybe the easiest way to choose between them is to think about the differences between Android and iOS and whether you want a phone that's pure Google or pure Apple. If all your movies are on iTunes, for example, then you're not going to be able to watch them on the PIxel 2 XL. On the other hand, maybe you don't watch movies on your phone anyway. Something else to bear in mind, if you are actually choosing between these two handsets as your next mobile phone: new iPhones and new Pixels are expected before the end of 2018. That means you might soon be able to get these phones at a cheaper price, or you might prefer the new models that are yet to be unveiled.